A sign in state Rep. Christine Drazan's Capitol office depicts the state's motto and a piece of inspiration for herself: "She flies with her own wings." "I adore it," she said. "It's fitting for the state and inspiring for me in my first term." Drazan, elected as representative of House District 39 last Nwovember, takes this motivation with her through busy days of committee meetings and working on the legislative floor. Every elected official brings a unique perspective to Salem, and they all come away with stories from navigating the state Capitol. A passel of Pamplin Media Group reporters visited the center of state government Thursday morning, March 28, to meet with Rep. Christine Drazan, R-Canby; Rep. Piluso, D-Gresham; Sen. Laurie Monnes Anderson, D-Gresham; Sen. Chuck Thomsen, R-Hood River; and Rep. Anna Williams, D-Hood River. 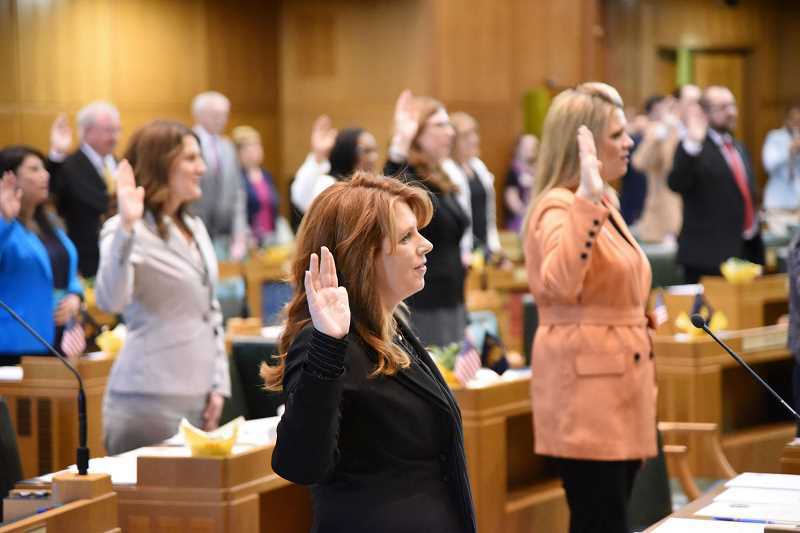 The lawmakers shared their experiences trying to make life better in Oregon one bill at at time. Upon arriving at the Capitol each day, Drazan typically enters the building through the rotunda. "It gives me a few minutes to appreciate the building, and think about why I'm here," she said. "It makes a big difference to how I approach the busy, active partisan process here." Drazan lives in unincorporated Clackamas County between Canby and Oregon City and wakes up at "precisely" 5:04 a.m. to arrive at in Salem by 7:30 a.m. During her hour-long commute, she listens to podcasts. "I'm a devoted podcast person," she said, noting that she listens to news programs from Oregon Public Broadcasting, The New York Times and CanbyNow, along with devotional programs from Beth Moore and Joyce Meyer. Drazan noted that every day in Salem is highly structured. She serves on the Joint Committee on Ways and Means Subcommittee On Education, the House Committee on Economic Development and the House Committee on Health Care. Additionally, she co-chairs the recently formed Clackamas Caucus. "The interesting thing about this building is the stuff I used to take for granted doesn't happen here," she said. "You don't get up and walk around, and take a 15-minute break." So far, Drazan said, she's been fairly quiet on the legislative floor. "As far as making speeches, I'm really aware that my vote is my voice," she added, although she does plan to frequently speak out when topics like the carbon cap-and-trade bill are considered. "(The bill will be) different for rural Clackamas County, as opposed to someone who lives along a MAX light-rail line. It will be harder for people to make ends meet." Though some of her fellow legislators have reached across the aisle, Drazan noted that the environment is very partisan. "A bill comes in with Republican and Democrat amendments, and it feels like a procedural vote to just vote down the Republican proposals," she said. However, she remains optimistic for the future. "That first impression may not hold, and we might find new ways to work together," she said. In rare moments of down time, Drazan enjoys talking a walk on the neighboring Willamette University campus. Though it's not always an easy job, Drazan finds her role as a representative very rewarding. "Each day is absolutely different," she said. "There's always an unexpected bright spot in every day." Being away from loved ones for extended periods of time is quite possibly the greatest downfall to working at the capitol for District 52 Rep. Anna Williams, D-Hood River; and District 26 Sen. Chuck Thomsen, R-Hood River. Even three-term senator Thomsen, who's served the district since his election in 2010 said the time apart only gets worse every year. Thomsen has two granddaughters whose company he misses when in Salem. "I leave two lollipops in my jacket pocket where I sit at home," he said. "(My granddaughter) doesn't get to see grandpa every week, but she gets her two lollipops." Williams was fortunate to have her two sons (ages 8 and 11) and her husband down in Salem with her this week on spring break, but typically she mainly sees them via video chat. "We FaceTime for breakfast and I read them bedtime stories over FaceTime at night," Williams noted. Contrary to popular belief, there's not a great deal of contention in the air during legislative session, "Party doesn't matter — every legislator will help you if you need it," Thomsen noted. Though he's at a disadvantage on the floor as a member of the super minority this session, Thomsen said his Senate seniority makes certain aspects of Salem life easier. "There's no comparison between now and when I started," he noted. "You don't know what to ask until you see something when you're new. Now I know everything that's going on well in advance." He serves on the Capital Construction Committee, which he said still maintains an "ethos of bipartisanship." "(By focusing my time on this committee) I can help the areas in my district," Thomsen noted. "It doesn't matter if I'm in the super minority. I'll be in a good position to help the different entities in our district and bring back some money." Thomsen has a few Sandy- and Mount Hood-oriented projects on his plate for which he needs to garner further legislative support. He's working to help Sandy receive funds for its wastewater treatment plant update project, and he's also supporting a bill to help with rescue funding, especially in the Mount Hood area. "We're trying to find a way to recoup some of those costs of rescue services, (since) the counties end up footing the bill for those rescues," he explained. Williams also is working on a study of search-and-rescue programs and on getting that bill passed and funded, as well as several other projects to support affordable housing funding, health education programs, paid family leave opportunities and infrastructure updates to the Bridge of the Gods. As a member of the super majority and a new representative, Thomsen said of Williams, her schedule is much busier. "I didn't really know what to expect," Williams noted. "I'd never spent more than a day at a time down in Salem. I knew it would be busy and hard, and I wasn't wrong. (Salem has) fairly well lived up to my expectations." Expectations that don't always match reality often are those of her constituents. "Capitol culture is a lot more easygoing than I think the media led me to believe," Williams explained. "It's fun, but it's exhausting."